This is the magical rocket Injector used in rocket engines used to land 12 Apollo Astronauts on Moon. A pintle injector is a variable area injector consists of a movable pintle, an annular nozzle and the central pintle nozzle. Propellants from the center and annular nozzles collide near the pintle tip. These collisions creates the mixing of fuel and oxidizer. 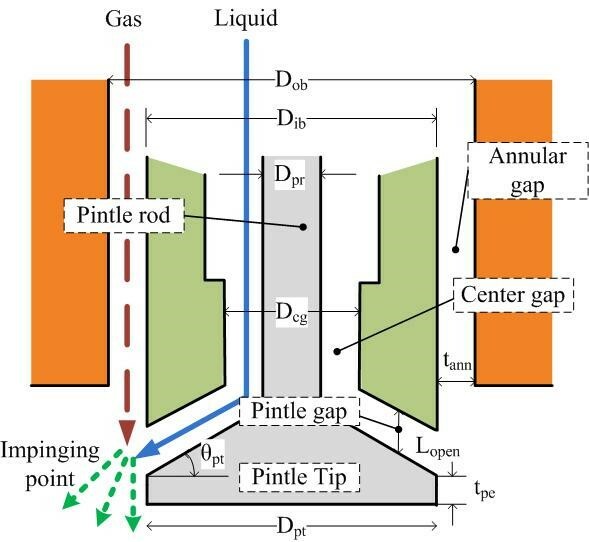 The angle between the pintle base and the conical surface is called Pintle angle and it has significant impact on atomization of propellants. Origin of pintle injector hails to some laboratory apparatus used to study the propellant mixing in NASA JPL in the mid 1950’s. A company named TRW (now part of Northrop Grumman) developed one injector in 1960, later in 1972 the design patent was publically released. Whenever a pintle injector related discussion takes place, TRW, is one of the first names mentioned. They deserve this recognition not only for the pioneer work started in the 60’s, that eventually led to a patent, but also because they have employed pintle injectors on hundreds of engines, ranging from a 10-Newton thruster up to the experimental 3-mega-Newton Low Cost Pintle Engine (LCPE). Till 2000 they have developed over 60 different pintle injectors and 130 engines were flown successfully. Spray from Face Shut off type pintle injector. Either fuel centered or oxidizer centered approaches can be used in design. 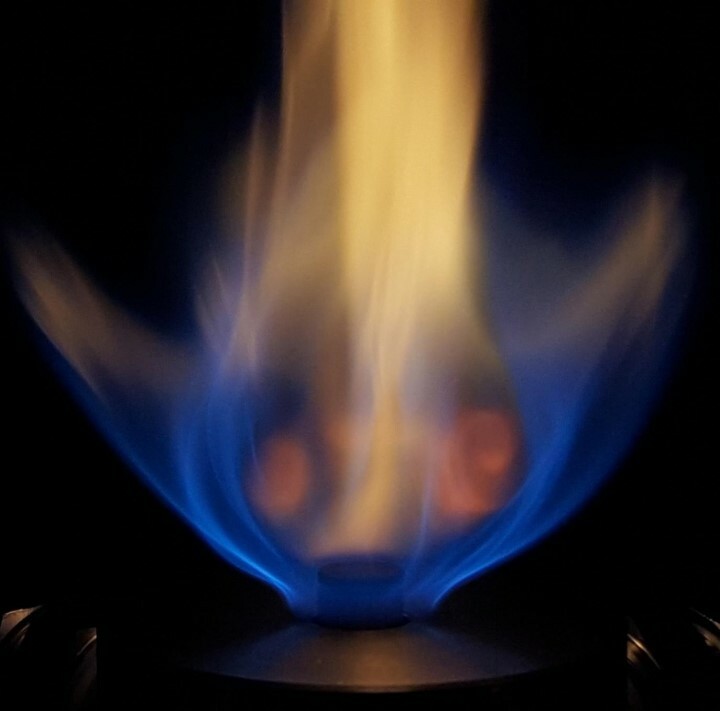 In oxidizer centered approach, there is a moving pintle at the center that controls the oxidizer and an annular gap on the outside of the inner body that controls the fuel. Schematic of a Face Shutoff type Pintle injector. LEM decent engine, SpaceX Merlin engine,BE-3 engine, Grasshopper engine,Kesterl Engine of Falcon 9 second stage. No correlations for level of mixing and spray size. Wider spray angles enables single injection element instead of multiple elements and subsequent weight reduction. When developing a throttleable rocket engine, variable area injector is known as a suitable choice because it is difficult to control thrust using a fixed shape injector with high-efficiency. These ability to throttle the thrust is essential when trying to reuse the first stage of the rocket engine otherwise allowed to burn in the atmosphere after the desired use. However, variable area injectors, especially a pintle injector, have recently attracted attention as next-generation injectors because of their associated benefits with respect to relatively newer engines. The pintle injector has a lot of attractive features such as the simple structure, throttling capability and combustion stability. 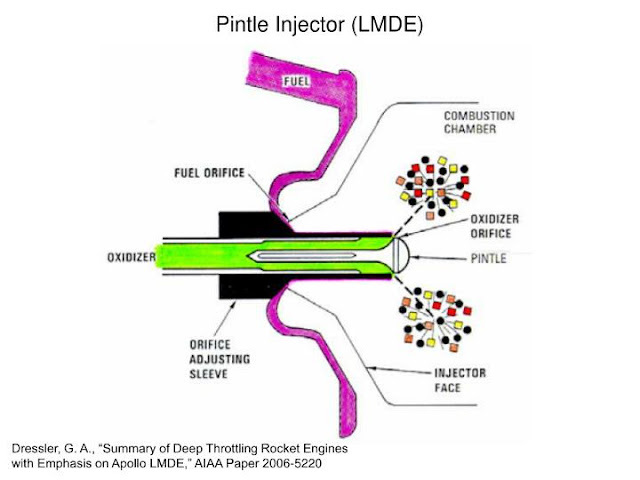 Due to the throttling capability and combustion stability, the pintle injector has been used for a propellant injection system of a rocket engine which is required to operate under wide thrust range, and throttling capability is required..
Pintle injector has wide spray angles, only one injector can cover the overall combustion chamber. It means that a heavy injector plate with many injector elements could be alternated to one unit of the pintle injector. It saves weight, there by improving the thrust to weight ratio of the engine. Pintle Injector Cold flow Testing for SpaceX's Raptor engine. Researchers demonstrate a pintle injector in a Grasshopper and Merlin of the Space X company and prove that the pintle injector has the potential to become the most preferred injector in the future. 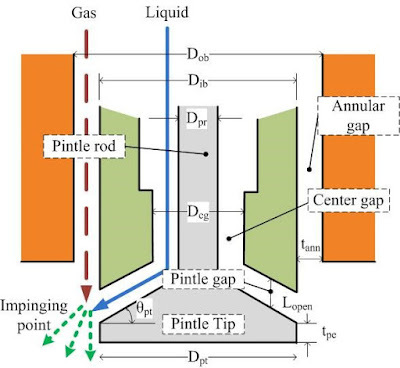 Numerous research groups have attempted to develop a pintle-injector engine, including Purdue University and the National Defense Scientific and Technical University in China. Flame from a Slit type Pintle injector. There were no combustion instability noted,even after scaling down thrust in scaling over a range of 50,000:1 in thrust and 250:1 in chamber pressure and 25 different propellant combinations. You can clearly see the two swirling zones on the left and right side of flame. This facilitates mixing and combustion stability. There are two types of pintle injectors. They are Face shut-off type and Slit type. The top most picture shows the face shut off type. Pintle of a Slit type pintle injector with slits on the circumference of the pintle. Another type of pintle injector is the face shut off type, it is the pintle configuration used in the Lunar Landing Module. This injector over the years made several modifications and slit type was choosen as the more preferred injector. Face shut off type was studied extensivly by Min Son and team from Korea Aerospace university. They have quantified the different parameters that afffect the performance of a face shut off type pintle injector. Spray patternator comparison of face shut off type and slit type pintle injector. A slit type pintle injector has several advantages over the face shut off type pintle injector. 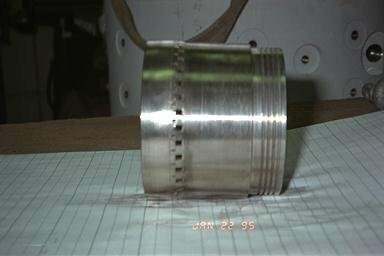 Slit type provides more even distribution of fuel and oxidizer inside the combustion chamber. Face shut off type has wider spray sometimes it is so wide that it will spray more propellants into the combustion chamber walls alone. The above graph clearly shows that face shut off type has very less propellant spray in the centre of the spray. However the Slit type has almost constant spray distribution through out the spray. Please be noted that the pintle angle of face shut off type pintle injector was 25 degree which might be a reason for more wide spray. However, thrust control by slit type pintle injector is expected to be poorer compared to the other injector. Merlin 1D is famous pintle engine from SpaceX. This pintle engine uses face shut off type pintle injector. Pintle is spring loaded and tightly pressed againist the pintle post. High pressure from LOX side pushes the pintle to open. By doing this SpaceX avoided upstream LOX valves which are costly as well as technically difficult to operate. This can also avoid the sequencing computer. Face shut off on a bigger engine is difficult to acheive, but they have done it marvelosly. But SpaceX owner elon musk wanted this design. So Space X started designing pintle engine using face shut off technique from 2011. They blew up several hardware while perfecting it. At last they made it perfect and enjoy its benefits now. This allowed Falcon 9 rocket to precisly control thrust as well as reduce the weight of pintle engine.Pintle engine always gives weight advantage over engines that use other type of injectors.